Helenka Kowalska was born in 1905 in a small Polish town, one of 10 children born into a poor family. She left school after third grade and never learned to write or read very well. She dreamed of becoming a nun and was very disappointed when her parents would not give their permission. They needed the money she earned as a housekeeper for other families. She was obedient to her parents, but her desire to enter religious life never left her. When she was 19, the young woman said she had a vision in which God told her to go to a large city in Poland to enter the convent. It is said that she took the next train to Warsaw. Helenka tried to join several religious orders, but they turned her down because of her lack of education. Finally the mother superior of the Servants of Our Lady of Mercy decided to give her a chance. 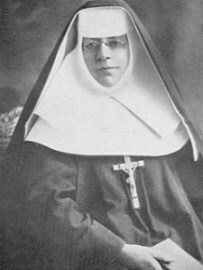 Helenka was given the name Sister Maria Faustina of the Blessed Sacrament. Sister Faustina worked in menial jobs that did not require education, as a cook, a gardener, and a housekeeper. But she was blessed by visions of Jesus, who gave her a special mission. Jesus wanted her to spread devotion about the Mercy of God and to help people remember that God our Father is merciful and loving to all people, even those who have turned away from him in sin. In another vision, Jesus asked Sister Faustina to have a portrait painted of our Lord as the King of Divine Mercy. 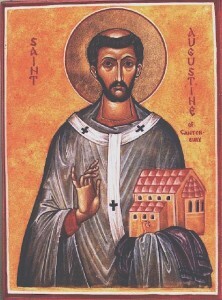 Jesus also asked Faustina to be an example of mercy for others and to imitate Christ by making sacrifices for others. Faustina did everything Jesus asked. When the other nuns made fun of Faustina and said her visions were fake, Faustina forgave them. 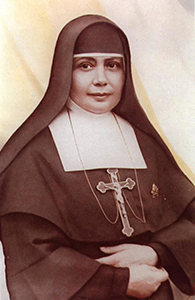 Her spiritual adviser told Faustina to keep a diary about her experiences and her visions. Because Faustina had such a poor education, the diary was difficult to read, but after her death in 1938, the spelling was corrected and her work was sent to the Vatican. It took many years and arguments, but finally, in 2000, Sister Faustina was declared a saint. Divine Mercy Sunday is now celebrated the first Sunday after Easter every year. In preparation for the Jubilee Year of Mercy, Pope Francis called Saint Faustina an "apostle of mercy" who provides us a wonderful example of trusting in God's ever-present mercy.